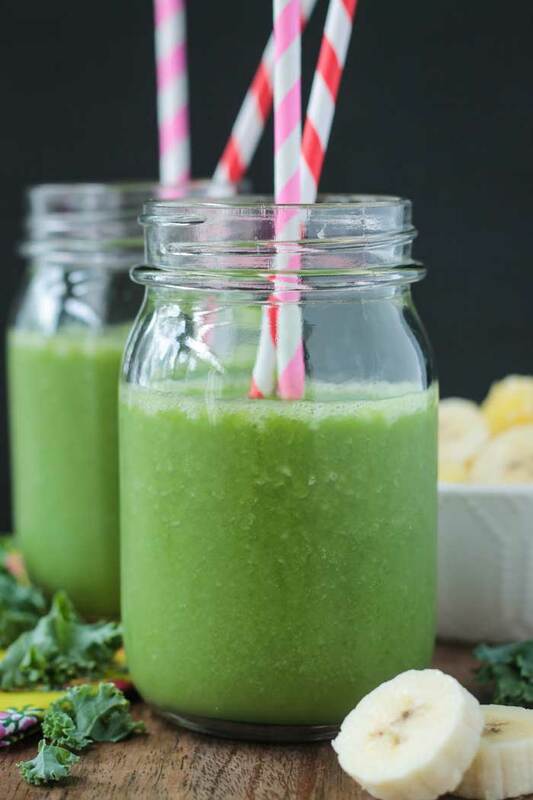 Pineapple Smoothie – Loaded with vitamin C, potassium, and protein, it’s the perfect way to start your day or recover after a workout. Sweet. Creamy. Refreshing. Bright. Nutritious. I could go on and on. This delicious sip has it all. I love the bright yellow color that reminds me of sunshine. I love the extra energy I feel after drinking it. I love the creamy, yet sippable, texture. But none of that matters if it doesn’t also taste good. Well, you’re in luck, because it’s delicious too! 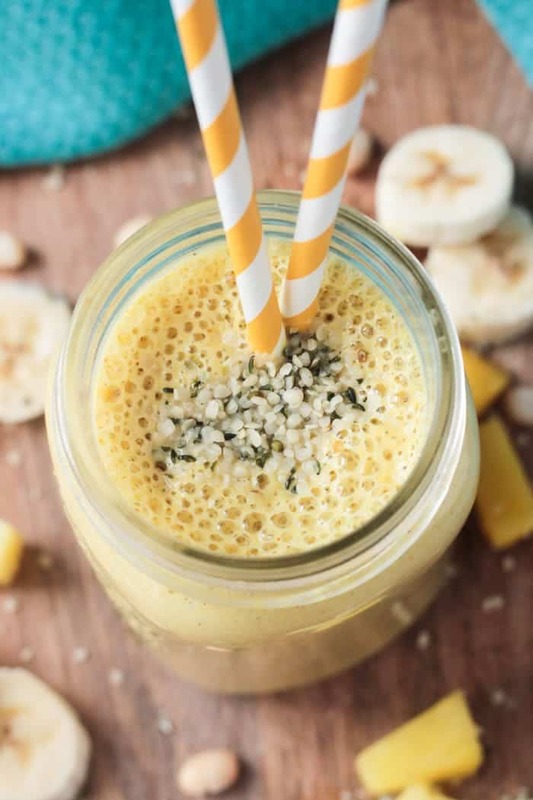 A superfood powerhouse Pineapple Smoothie that tastes as good as it looks! 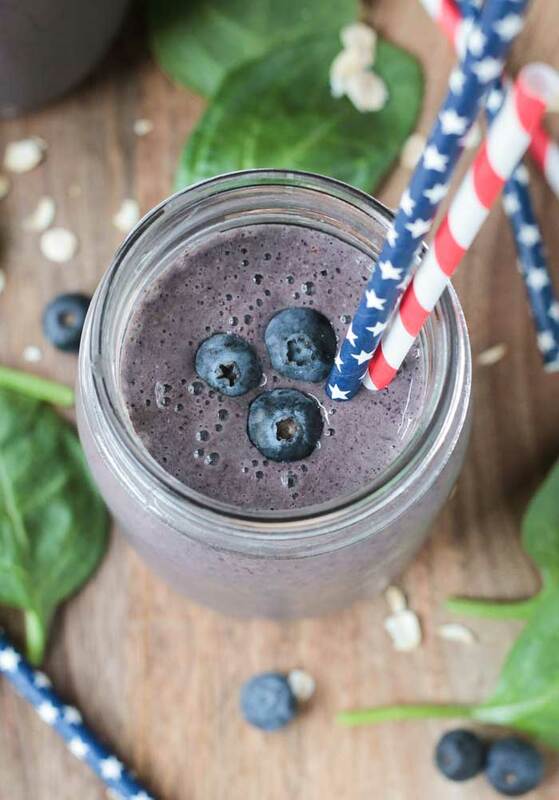 It’s dairy free and gluten free and even contains a surprising ingredient that increases the potassium, protein, and fiber! Curious? Keep reading! I first teased you about this smoothie about 3 weeks ago here, but then life got in the way. Last week was spring break and I had a nice long vacation from working and most responsibilities. The first part of break I was visiting my parents in Nevada and skiing with my dad. The weather wasn’t exactly what I was hoping for, but we had such a great time and skied 4 days in a row. I didn’t feel so bad about missing my regular workout schedule since I was putting in a lot of effort on the slopes. The last 4 days of break, I was back home and hanging out with my hubby and the kids. My workouts didn’t happen at all during that time, but I didn’t care. It was so much fun just relaxing as a family. But, alas, we are back to reality now. Kids are back in school and I’m back to the grind cooking and blogging and all that comes with it. Which also means I’m back to my regular exercise schedule and that’s where this delicious dairy free smoothie comes in. I generally workout in the late morning. I have a small breakfast before – usually a slice of sprouted grain toast or a banana w/ almond butter or a small bowl of healthy oatmeal. When I get back from the gym, I like to make a nutritious smoothie to aid in recovery. It’s important to have some protein, carbs, and healthy fats in your post workout fuel. I also find I’m not really up for eating right after a workout, so a smoothie is the perfect choice. Smoothies are easy to load up with nutrients and simple to sip as I attempt to get some work done. And finally – White Beans!! – I know it seems odd in a smoothie, but you won’t taste them at all! They provide extra creaminess, protein, and lots of potassium. I’ll admit, when I first set out to make a post workout smoothie, white beans were not my first choice. I wanted to add an avocado. But when I cut into my seemingly perfect green fruit, it was black inside. Yuck! And I only had the one. So, I took a peak in the fridge to see what I could use instead and found some leftover white beans from these delicious Spinach Artichoke White Bean Burgers. They worked perfectly! 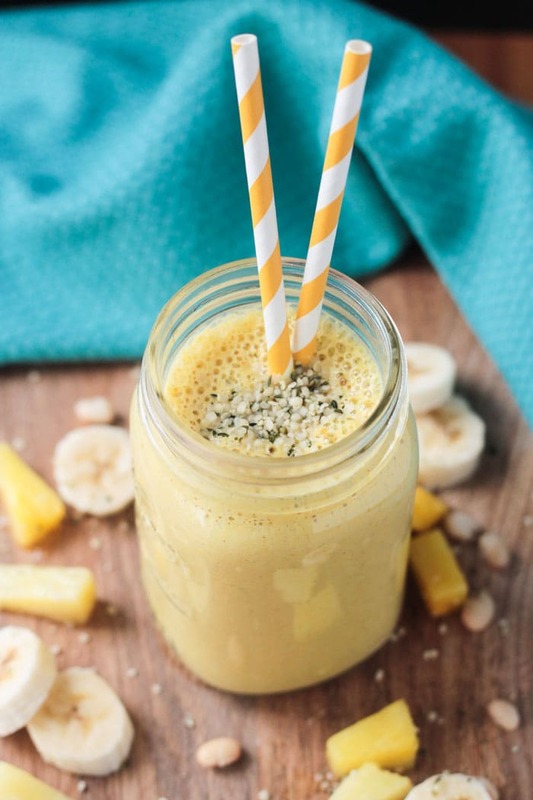 And I love the golden color of this pineapple smoothie – which obviously would have turned green had I added an avocado. Bonus – cans of white beans will last nearly forever in your pantry and, once opened, any leftovers can be easily frozen – meaning they will always be at the ready when you are. 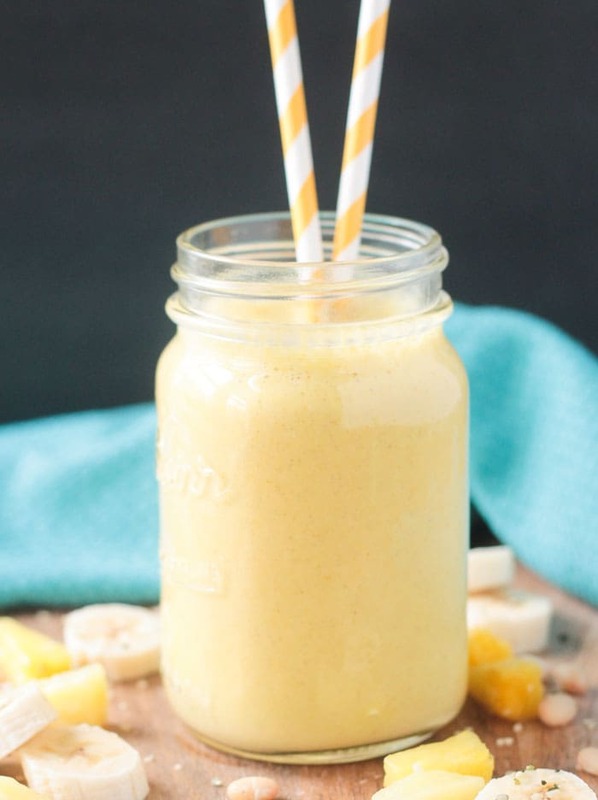 I hope you love this Pineapple Smoothie as much as we do! If you try it, please come back and leave me a comment below with your feedback and star rating. You can also find me on social media. Be sure to tag @veggie_inspired and #veggieinspired so I’m sure to see it. Enjoy! 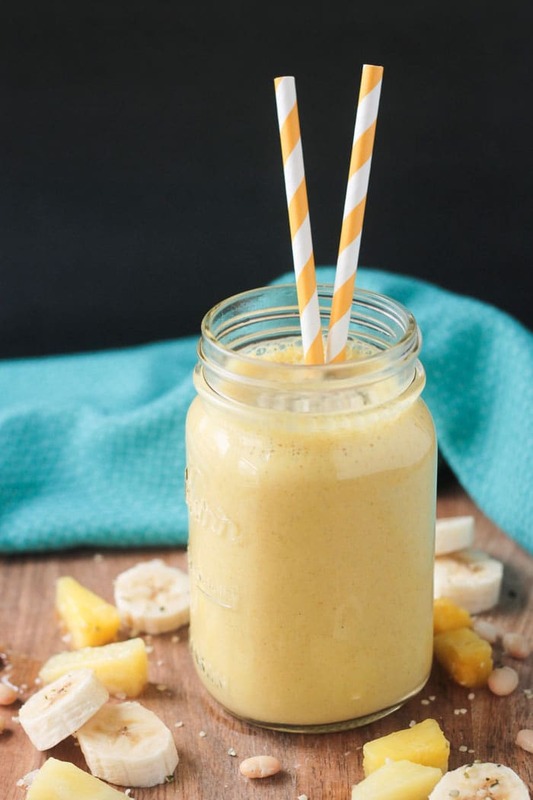 This Pineapple Smoothie is loaded with vitamin C, potassium, protein, and even some superfoods. It's the perfect way to start your day, snap out of an afternoon slump, or recover after a workout. I prefer frozen fruits in this smoothie, but fresh definitely works too. Just make sure you add several ice cubes if you use fresh fruit to make sure it's cold and creamy! I use powder, but fresh would work, too. I just don’t know how much fresh to tell you to use as I have never worked with it. Enjoy! Hi! I was wondering if I could use flaxseed or pumpkin seeds instead of hemp seeds? I live in a small college town that has no hemp seeds anywhere. Hi, Alica. Either one would work just fine! Enjoy! Beans in a smoothie?! You are brave lady! I definitely wouldn’t have thought to take that challenge on, but it looks really good! HaHa! Who knew, right?! Try it and let me know what you think! Awesome! Can’t wait to hear! I’ve been using white beans in my smoothies recently. They make them so creamy. I am loving this smoothie. 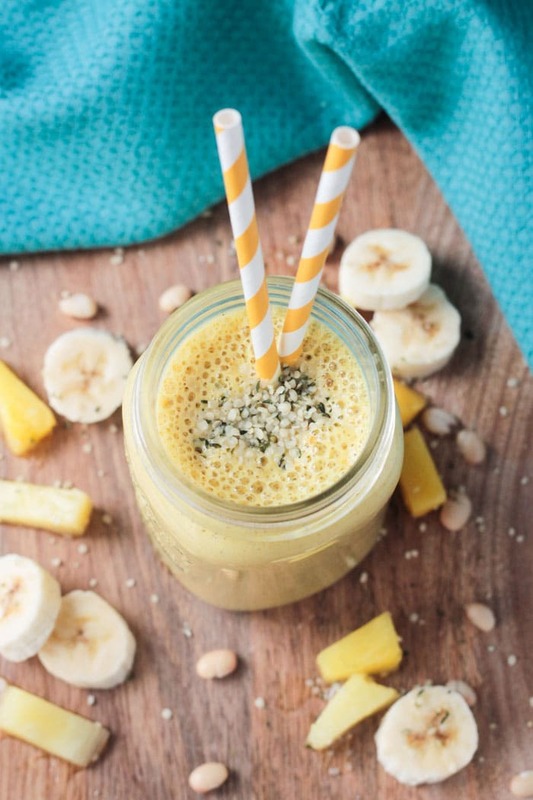 Pineapple is one of my favourites and there are so many lovely flavours in there! Yay for bean smoothies! 🙂 Thanks, Mel! I’ll have to try this magical elixir after my Saturday long run! Oh yes, it would be perfect! Let me know what you think! I adore pineapple in smoothies. So delicious! And hemp seeds! This has all of my faves! Ah ha! I would never have guessed that the secret ingredient is beans, but I can totally imagine this working. Who knew beans were quite so versatile!? I know, right?! And they are basically flavorless so they could really go in just about anything! Thanks, Natalie! This looks so refreshing! I love the addition of the beans! Yes, thank you, it was so nice to get away for a bit. I always have beans hanging out in the fridge, so they are the perfect addition. 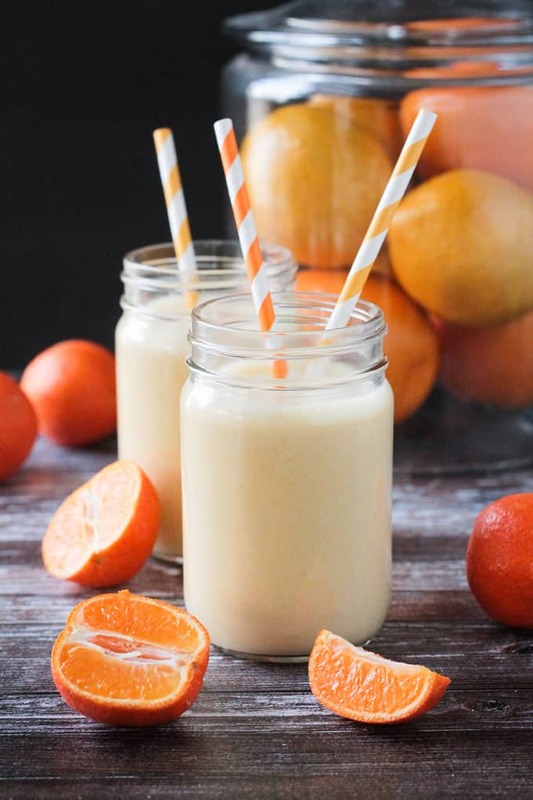 They also make this smoothie a bit more filling without really adding any more fat. Win! Thanks, Mary Ellen! I love hemp seeds – one of my favorite add-ins! And, yes, the beans worked surprisingly well. Since I always seem to have beans hanging out in my fridge, it’s perfect!